The GE EPS601 Electrophoresis Power Supply offers you consistent power and protection for your blotting, nucleic acid submarine and mini vertical gel electrophoresis needs. A constant current mode is available for blotting, with a constant voltage mode for your other applications. This electrophoresis power supply is capable of both timed and continuous runs which can be set up from the easy to read digital display. The single unit increments of settings and read outs offer precision and reproducibility. 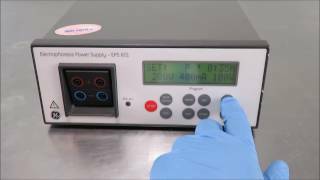 The GE EPS601 Electrophoresis Power Supply can store up to three protocols, and can run duplicate parallel runs through two pairs of power outlets. In the event of a power failure, this power supply will recover automatically. To protect experiments and equipment, an automatic parameter limit crossover prevents this electrophoresis power supply from overheating, in addition ot the overload/short circuit protection, ground leakage protection and no-load detection. This GE EPS601 Electrophoresis Power Supply has been inspected and performed to expectations. All of our lab equipment comes backed with our standard warranty. Should you have any questions, please don't hesitate to contact us.